Code Red Defense™ is a revolutionary self-defense system. It was created to help you learn how to effectively protect yourself if ever you were to be attacked. This system is based on real life scenarios and will help you learn self-defense faster and easier than ever before. 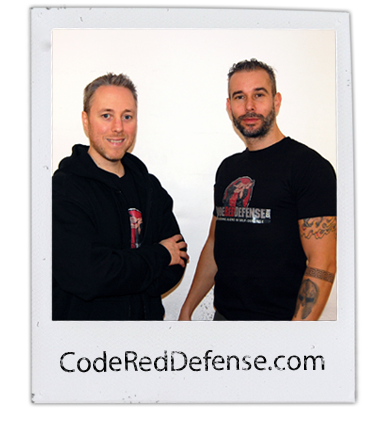 Code Red Defense™ was founded by two people that are very passionate about self-defense; Nick Drossos and Patrick V.
Nick Drossos has trained in Kung Fu, Taekwondo, Reality Based Self Defense, Mixed Martial Arts (MMA), Boxing and Kickboxing. He has worked on the Montreal night life scene as security for over 7 years, as well as a bodyguard for high profile clients; and has done private security during large scale events. He is also a certified personal trainer and has acquired TRX, KettleBell, Kickboxing and Yoga certifications. He presently trains celebrities such as Sugar Sammy and Goûchy Boy, and has worked on various film sets. Today Nick Drossos is recognized as one of the top reality based self defense instructors in the world, with hundreds of thousands subscribers and millions of views on YouTube. Patrick V has trained several years in a Reality Based Self-Defense system. He has also trained in Kickboxing and Kung-Fu for half a decade. Furthermore, Patrick worked in security for many years, allowing him to gain field experience with dangerous situations. This exposure brought experience in dealing with not only physical conflicts, but also an understanding of the body's adrenal response to many different type of conflicts. Patrick is not only passionate about self defense; but endorses a healthy lifestyle and has a high interest in Survivalism. Having developed a solid sense of awareness, he is constantly looking to encourage others to live a safer life. Code Red Defense's name was inspired by the colour code awareness system. These self defense colour codes refer to the state of awareness required for different circumstances and places. “Code Red” is the highest state of awareness; meaning there is a definite threat and you will need to react. Our mission is not only to keep you safe, but also to empower you. Our videos will provide you with all the tools needed to learn how to defend yourself against any verbal or physical attack. They will give you the mental and physical edge you need to start living a life free of fear. We are highly confident that our self defense videos will provide safety for you and your family. On our Code Red Defense™ channel we offer free videos for you to watch and learn how to protect yourself effectively. Visit the channel today and subscribe to receive new videos regularly. Subscribe to the Code Red Defense™ newsletter and receive a free video on the Top 5 Dirtiest Self-Defense Fighting Tricks – along with plenty of effective advice on personal protection and related topics. Trust our team in teaching you the latest and most effective self defense strategies today!